The food and kitchen utensils in this painting appears casually arranged. These displays are, however, based on carefully calculated visual relationships. In Still Life with Fowl, the curving forms of the mortar and pestle echo that of the green jug. The scene betokens an intimate domesticity, a place of blessing related to the fundaments of human life. [your work] exists between nature and art.” Chardin’s skill at imparting the haptic, or tactile, qualities of motionless objects through the steady emphasis of his brush, rather than a faithful reproduction of the details, promotes a sense of quiet harmony. MM. Laneuville and Henry, Paris (sale, Paris, 9-11 April 1822, lot 85). Born into modest circumstances, Jean-Baptiste Siméon Chardin had little interest in the grand subjects of history painting and portraiture. His audience was the growing French middle-class, whose everyday sights and activities were the subjects of his observations. These two still-lifes from about 1730 are arresting and charming, because their subjects are as ordinary as they are unusual. Few artists at the time would have considered them worthy of depicting. The display of food and kitchen items may seem casual. But in fact, it is very deliberately planned. 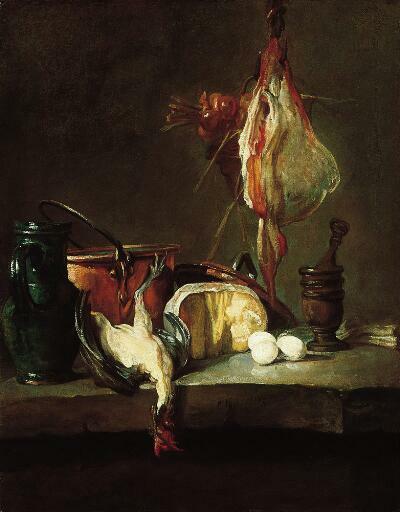 At the right, in Still Life with Cooking Utensils, Chardin creates a grand pyramid from humble objects, leading the eye from the white cloth on the left up to the hook that holds a large piece of meat and back down to the roots of the green onions. On the left, Still Life with Fowl is more complex, but equally balanced by carefully juxtaposed colors, shapes, and textures. Everything seems in perfect equilibrium. The pigment is applied in thick layers, expressing its physicality and giving some of these objects actual substance. Trained by minor artists, Chardin eventually became the finest still life and genre painter of 18th-century Europe. The great portraitist Nicolas Largillière, recognizing his exceptional gifts as a colorist, sponsored his election to the Royal Academy as a painter of “animals and fruit.” After his death in 1779, Chardin was soon forgotten, only to be rediscovered by the 19th-century masters Manet and Cézanne, who valued his frank realism and keen artistic eye. To hear more about paintings of everyday life in the 18th century, press 1721.